SUMMARY: We present the case of a patient with a fusiform aneurysm of the M1 segment of the middle cerebral artery (MCA) in which endovascular stent placement without coiling was performed. A 3.5-mm × 25-mm LEO self-expanding stent was deployed along the fusiform aneurysm of the horizontal MCA M1 segment. Digital subtraction angiography showed progressive thrombosis at 6 months and complete thrombosis of the fusiform MCA aneurysm at 12 months. The introduction of the Guglielmi detachable coil in 19911-2 radically changed the approach to intracranial aneurysms, and endovascular treatment became a frequent choice for many ruptured intracranial aneurysms. Recently, new techniques and materials have widened the range of aneurysms susceptible to endovascular treatment. However, the management of fusiform intracranial aneurysms remains controversial. We present the case of a 52-year-old man with a fusiform aneurysm of the middle cerebral artery (MCA), who was successfully treated with the placement of a Leo stent. To our knowledge, this is the first fusiform MCA aneurysm successfully treated using the placement of a neurovascular dedicated stent. A 52-year-old man was referred to our hospital for a partially thrombosed fusiform large aneurysm of the M1 segment of the MCA. The aneurysm was diagnosed after the patient had undergone MR imaging at another institution because of acute-onset aphasia and right hemiparesis. The patient's medical and family history was unremarkable. MR imaging examination revealed a partially thrombosed MCA aneurysm and a subacute infarction in the left MCA territory (lenticulostriate branches). 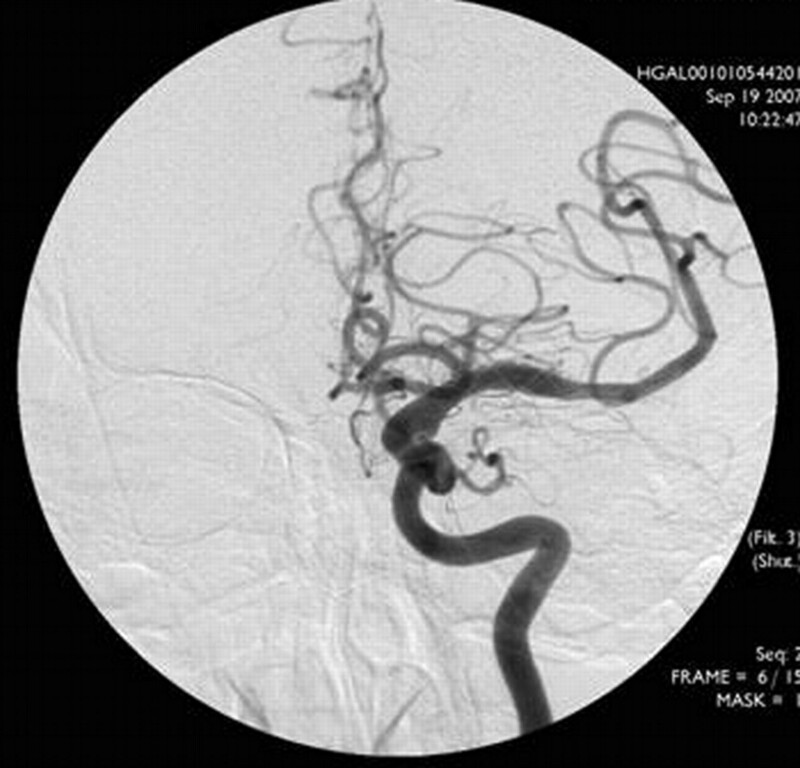 Digital subtraction angiography showed a large fusiform aneurysm (1.7 × 1.5 × 1.4 cm) that extended over the horizontal segment of the MCA (Fig. 1). Anteroposterior (AP) digital subtraction angiographic image showing a fusiform aneurysm of the horizontal segment (M1) of the left MCA. The patient experienced a marked neurologic improvement. Because of the persistent risk for thromboembolism, endovascular treatment was performed. The patient was pretreated for 3 days with aspirin 325 mg/day and clopidogrel (Plavix) 75 mg/day. After induction of general anesthesia, a 6F Envoy guiding catheter (Cordis, Miami Lakes, Fla) was placed in the internal carotid artery. The patient was anticoagulated with intravenous administration of heparin; the activated clotting time at 2.5 times the basal level was maintained. The aneurysm was bypassed with a Prowler microcatheter (Cordis) distal to the neck of the aneurysm. A 300-cm, 0.0014-inch exchange wire was placed through the microcatheter. The microcatheter was removed, and a Vasco (Balt, Montmorency, France) microcatheter 21 was advanced over the wire to the intended site for the distal end of the stent. The wire was then removed. Thereafter, the LEO stent delivery system was advanced inside the Vasco, and a LEO stent (Balt; 3.5 × 25 mm) was deployed easily over the neck of the aneurysm in a satisfactory position (Fig 2). The patient was maintained on daily aspirin (200 mg) and clopidogrel (75 mg) for 3 months after stent placement, after which the patient was switched to a single antiplatelet agent (aspirin 100 mg) daily. LEO stent (3.5 × 25 mm) placed over the neck of the aneurysm. The procedure was well tolerated, and there were no complications. A CT scan performed after the procedure excluded any hemorrhagic complication. The patient was discharged from the hospital 7 days after treatment with no neurologic deficit. 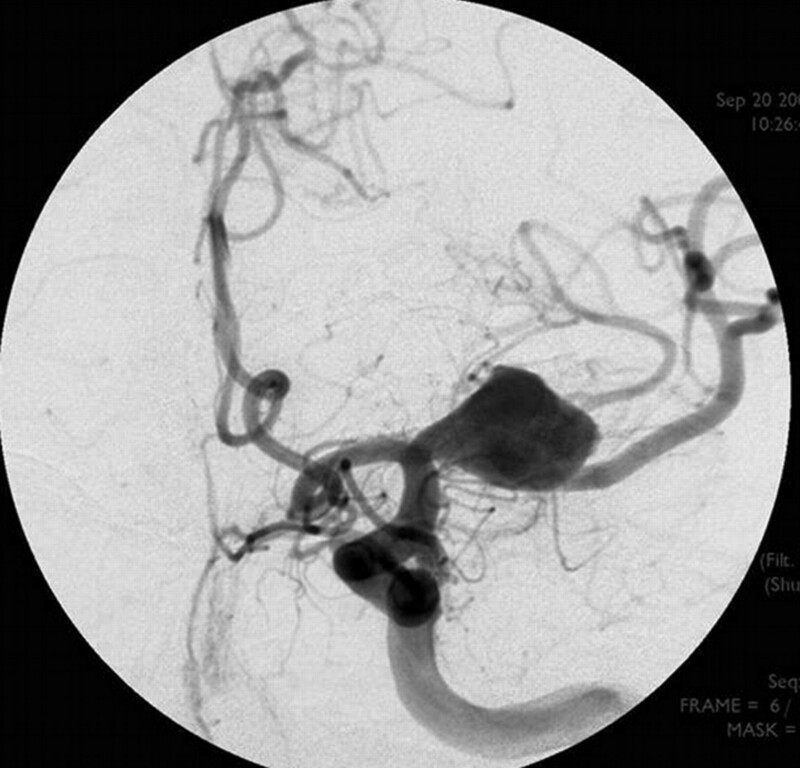 A 6-month follow-up angiogram revealed almost complete occlusion of the aneurysm and patency of the left MCA (Fig 3). An angiogram at 1-year follow-up confirmed complete thrombosis of the fusiform aneurysm with preservation of parent vessel patency (Fig 4). A 6-month follow-up AP angiogram showing decrease in the size of the aneurysm. A 1-year follow-up AP angiogram confirmed complete thrombosis of the fusiform aneurysm with preservation of patency of the parent vessel. Endovascular therapy is the treatment of choice as opposed to traditional neurosurgical treatment of ruptured and unruptured aneurysms. Many innovative techniques are now available for the treatment of aneurysms. 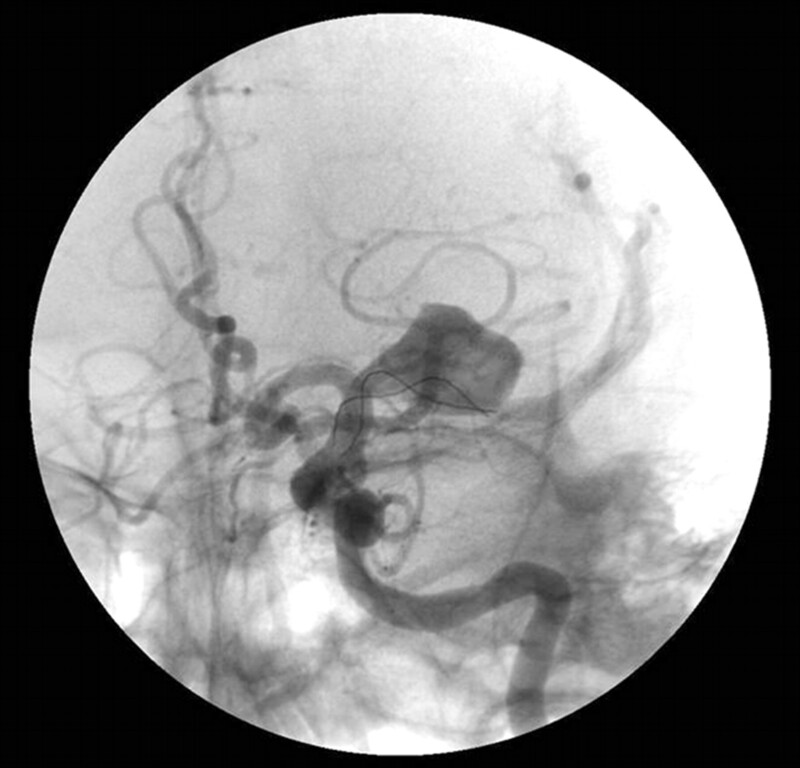 The release of a 3D Guglielmi detachable coil (Boston Scientific, Natick, Mass) represents an important advancement in coil technology, and balloon-assisted embolization has proved to be valuable for the treatment of broad-necked aneurysms. The use of liquid embolic agents for embolization of cerebral aneurysms, both with or without stent or balloon combinations, has also been reported.3 The adequate management of giant or fusiform aneurysms, however, requires an innovative approach to vascular reconstruction. For the achievement of complete aneurysmal occlusion, the use of a combination of stents and detachable coils has recently been introduced.4-7 However, the clinical use of this technique has been restricted because of the difficulties associated with the endovascular navigation of stents into the cerebral vasculature. The advent of new-generation flexible neurovascular dedicated stents permits safe and reliable percutaneous access to the intracranial vasculature, which has transformed this technique into a viable therapeutic option for the treatment of many fusiform or giant intracerebral aneurysms. 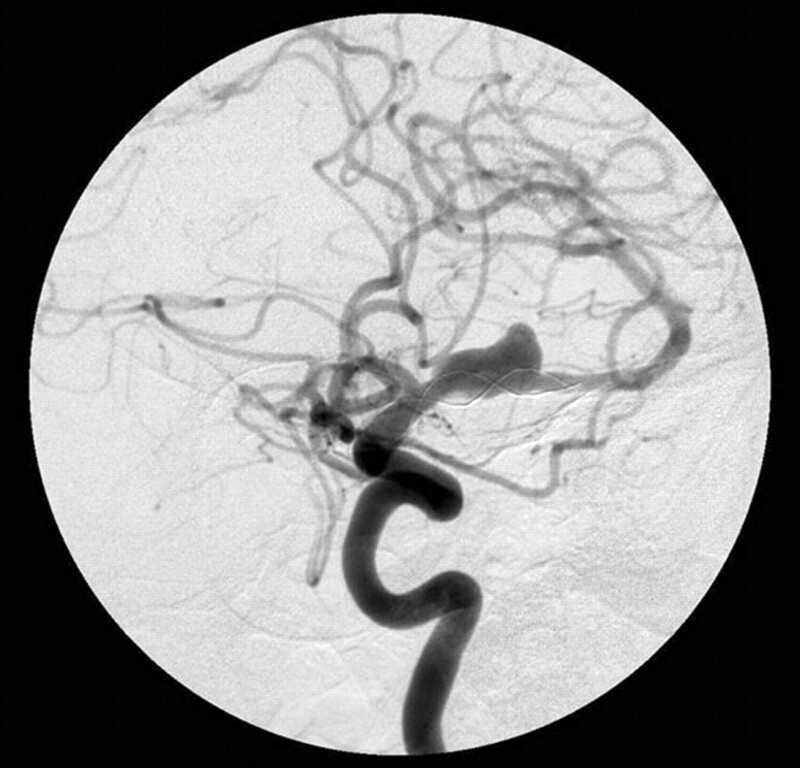 Nevertheless, coiling and stent placement of fusiform aneurysms have frequently resulted in subtotal occlusions or thrombus in the aneurysm, causing distal embolization with the coiling. Repeated angiograms at 6 and 12 months revealed complete thrombosis of the aneurysm. Spontaneous regression of cerebral aneurysms has rarely been reported.11,12 As for changes in flow patterns, the presence of a stent disrupts the flow in the aneurysm, and flow activity increases after stent placement, but wall shearing is reduced as small scale vortices are generated. To date, 3 patients with intracranial aneurysms have been successfully treated with stent placement without coiling.11-13 Of these, 1 patient had a mycotic fusiform aneurysm treated with a Neuroform stent, the second patient had a giant aneurysm treated with a covered stent, and the third patient had a giant aneurysm treated with a LEO stent. Research on the stent placement of fusiform aneurysms is scarce; hence, the working principle of the treatment of fusiform aneurysms with stents remains unclear. In our patient, the outcome with a neurovascular dedicated stent without coiling for the treatment of a noninfectious fusiform aneurysm of the MCA was good. Because we report the only case in the literature to the best of our knowledge, additional research is required to assess the benefits of stent placement without coiling for the treatment of a fusiform aneurysm of the MCA. Accepted after revision April 5, 2008.